2nd printing! Newly expanded to 176pp! Monsters abound. They litter the halls of our collective games like so much debris; wandering monsters, laired beasts, plane walkers, horrid thoughts that linger upon the edge of our imagination. As any gamer of any stripe knows, you can never have too many creatures, for these are the grist for the mill that is our game. The early days of gaming saw some of the most classic and amazing creatures; weird beasties derived from the minds of people influenced by a genre of fiction that was in its prime, when fantasy truly meant the fantastic. 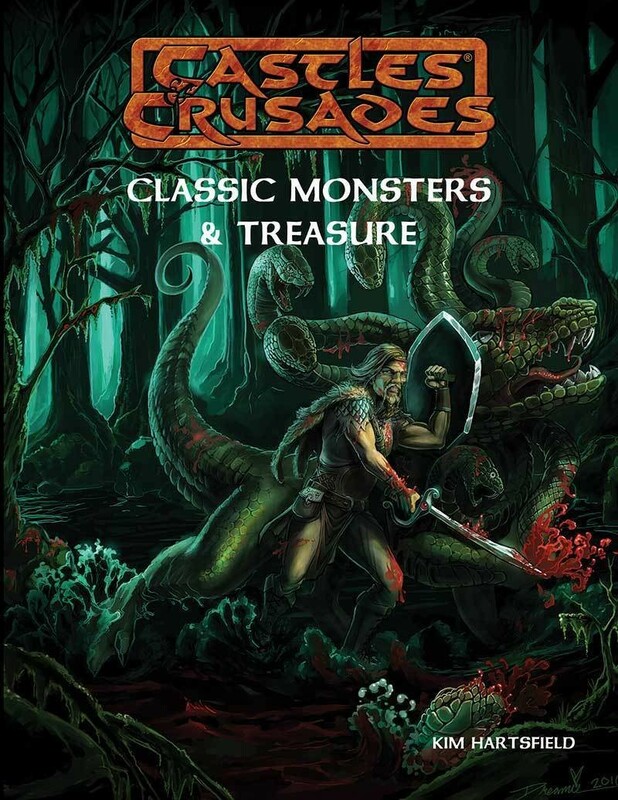 Castles & Crusades has touched upon them from time to time, but by and large they have remained in the background. Until now. Kim Hartsfield, long-time veteran of classic gaming, brings many of these monsters back to life. Anyone who games with Kim knows he runs a hard-knock game of classic dimensions and epic adventures. Kim revisits the old monster books, MM II and the Fiend Folio, mining their pages for all those classic monsters that mystified and horrified young gamers of every description. From the tarrasque to the peryton, from the mighty-small dune stalker to the nightshade, Kim brings it all back to the table.